On the hunt for Amish furniture in Arizona? Lancaster County may lie thousands of miles away, but residents of the Grand Canyon state have a number of options for Amish bedrooms, dining rooms, office furniture, and more. Amish are known for their high-quality craftsmanship and wide array of furniture styles, including Shaker, Mission, and many others. Amish don’t live in Arizona today, but authentic handmade Amish furniture is within easy reach of Phoenix, Scottsdale, Glendale, and a reasonable drive from Tucson. Amish-made furniture from the Holmes/Wayne County, OH settlement. Bedrooms, office suites, children’s furniture, entertainment centers, more. Hardwoods include cherry, maple, brown maple, walnut, walnut, oak, quarter-sawn oak, hickory. Steiner’s Amish Furniture site presently lists two Arizona locations. A lighting shop which also sells Amish furniture. Furniture dealer which offers non-Amish lines as well as some Amish furniture. 2710 N Glassford Hill Rd. For a directory of Amish furniture outlets across America, visit the Amish Furniture Guide main listings. Or read more on Amish Furniture in Phoenix. Note to Arizona residents: Please be sure to check opening hours of any Amish furniture businesses listed in this guide before traveling long distances. While we strive to keep this directory up-to-date, business locations and schedules can change. Not responsible for changes to information. Amish once briefly lived in Arizona, in the vicinity of Phoenix, but none are found in the state today. However, over the past few decades a number of Amish have begun settling in Western states including Colorado and Montana. The furniture trade has been key to Amish migration. Amish have moved westward in search of more affordable land. With their large families and expanding communities, room is at a premium in some Amish locations. Dairy farming has become more difficult due to the price of land in some settlements. For the Amish, furniture manufacturing has come to be seen as a more and more attractive option. Amish settlers to Colorado, for example, have opened furniture shops in addition to other businesses. Furniture making allows Amish to tap into traditional skills while maintaining an occupation at home. Furniture shops can be started with relatively little capital, and in most cases less than starting a standard dairy. Family is often heavily involved in the typical Amish furniture workshop. Children may learn a trade under their parents’ watchful eyes. Wives chip in to help the Amish furniture operation run smoothly, sometimes doing bookwork, handling customers, or even aiding in the shop. Some Amish communities, such as Holmes County, Ohio, and Lancaster County, PA, are particularly well-known for their high furniture production. Amish wood workers in these settlements ship to furniture outlets in Arizona and other states. Non-Amish retailers sell Amish tables, chairs, outdoor furniture, and much more, in locations across the nation. Online Amish furniture retailers do a brisk trade as well, with shipping typically available nationwide. Amish furniture comes in an extensive range of styles, stains, and varieties of wood. Popular traditional styles such as the Mission, Shaker or Queen Anne designs are common to Amish furniture lines. 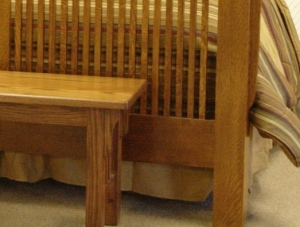 Amish furniture is known for the use of hardwoods, including oak, cherry, maple, and walnut. Amish produce furniture and home accessories for every room of the house–from bedroom sets including bedframes, dressers, armoires, chests of drawers, and nightstands, to office suites with computer desks and bookshelves, to kitchen arrays including tables, chairs, barstools, and of course custom-crafted kitchen cabinets. Amish furniture manufacturers and retailers often offer a standard line of furniture. Other Amish furniture makers specialize in custom work. 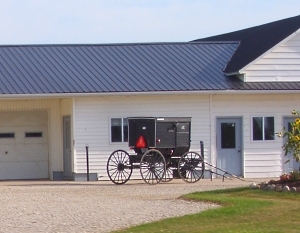 Some Amish shops primarily or exclusively do wholesale production. Others focus on retail sales, and include an on-site furniture outlet. Still others mix both retail and wholesale in one operation. Will Amish ever settle in Arizona? Some Amish have been known to vacation in the Copper state, but no permanent Arizona Amish community exists. However, with high Amish population growth, and Amish willingness to migrate, it’s possible Arizona may see its own Amish furniture makers in future.